As stated before this is between a force of Ancient British and the evil empire – Rome. The British start of with 5 Deep class warrior units, 2 light shooty units (1 slinger, 1 javelin) and 4 Light Chariot units. With these go 2 leaders, one mounted, one on foot. The force is divided into 2 halves. For To The Strongest (TTS) this equates to 5 Warrior units x3 Victory points (VP) plus 6×1 (light units) VP plus 4 VP (leaders) for a total of 25VP. In TSS this then equates to 8 Victory Medals – these are you’re in game success/failure measure – each unit you lose you lose medals – once you have no more medals you have lost the game. For the British each warrior unit lost will cost 3 medals – as you can see you can quickly lose. As points go this is 101 points, no veterans. The British also have 8 heroes. Generals and heroes mean you can replay certain card draws. The Romans have 7×2 (Legionaries/auxiliary)+ 5×1 (light units)+ 2×2 (Generals) = 23 – so resulting in 7 Medals. 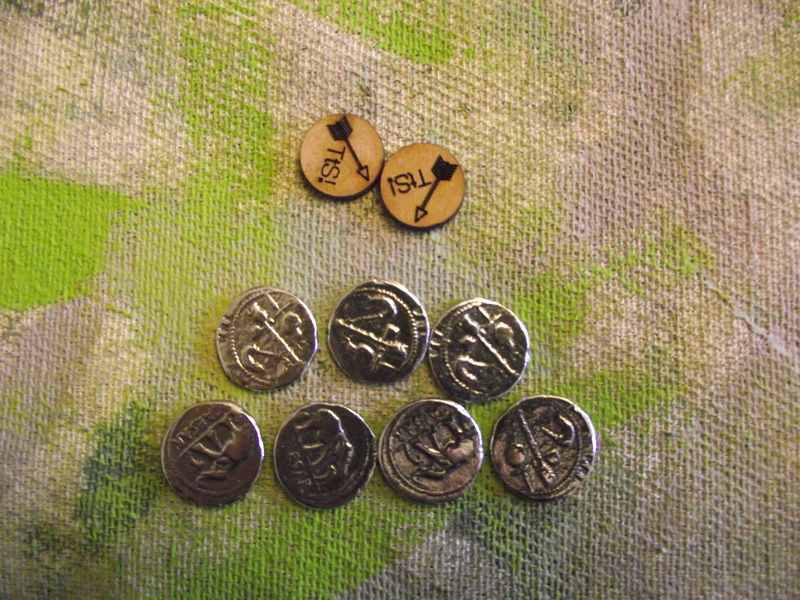 However each legionary/auxiliary unit is a regular class and if they are lost costs only 2 medals. As points go this is 121 points, no veterans. The Romans have 4 heroes. 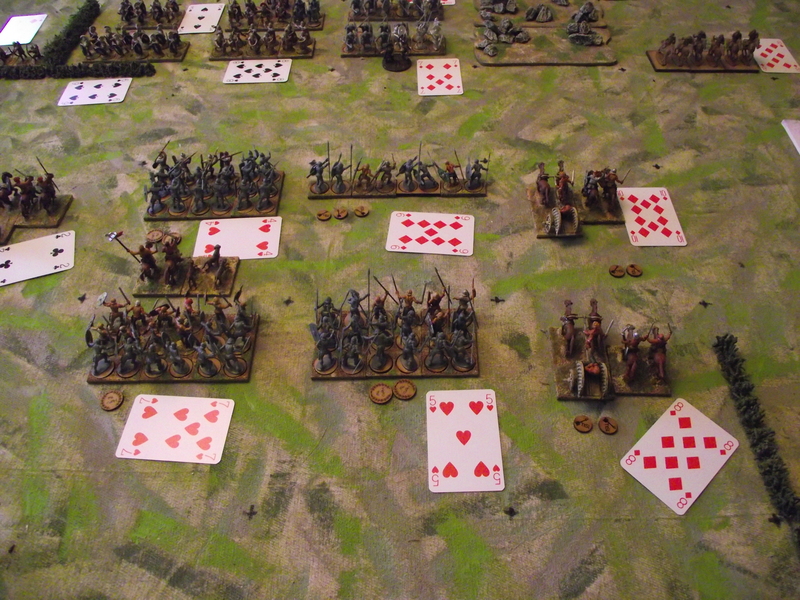 The Romans got the Queen of Spades – which means one unit has come to the battle especially well motivated. First move is the left hand command of the Romans – all except the light slingers moved a march move (a non attacking double move) this can be done if not starting or ending adjacent to the enemy. The lights couldn’t do this because they would have entered rough terrain – so only moved a normal move – unfortunately they drew a 9, so were not likely to be able to move again. Activation to move for a simple move is by drawing a 2+ card, for a difficult move its 3+. 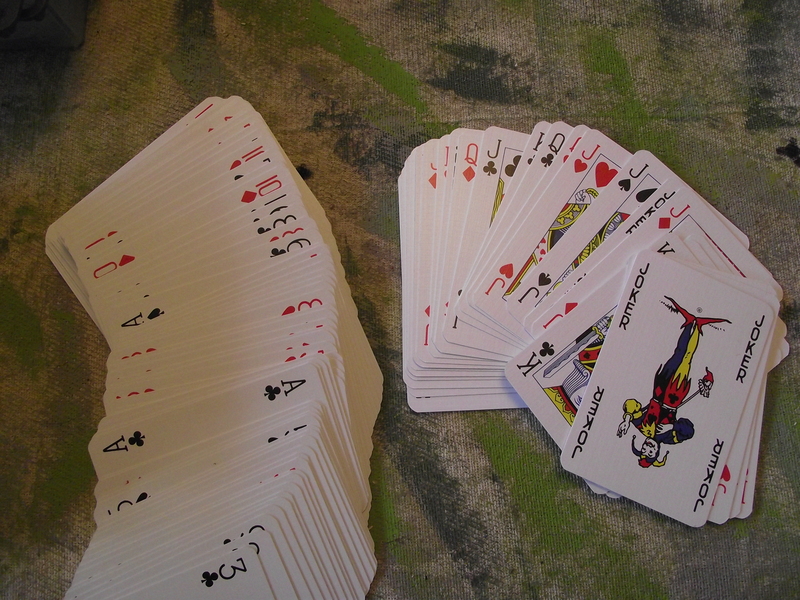 The units in the command can keep moving as long as they keep getting higher than the last card the unit drew – so the lights drawing a 9 only had a 10 that was higher – so, unlikely to get that (10% chance); if one unit fails then the whole command fails – so deciding on the right order is vital. The lights did try to move again when the rest of the command had moved – they got a 6 – so failed. Move now goes to the second command. If my General had been with the lights he could have redrawn the card, a skill the generals have once per turn. The Roman second command moves forward as planned – no hiccup. 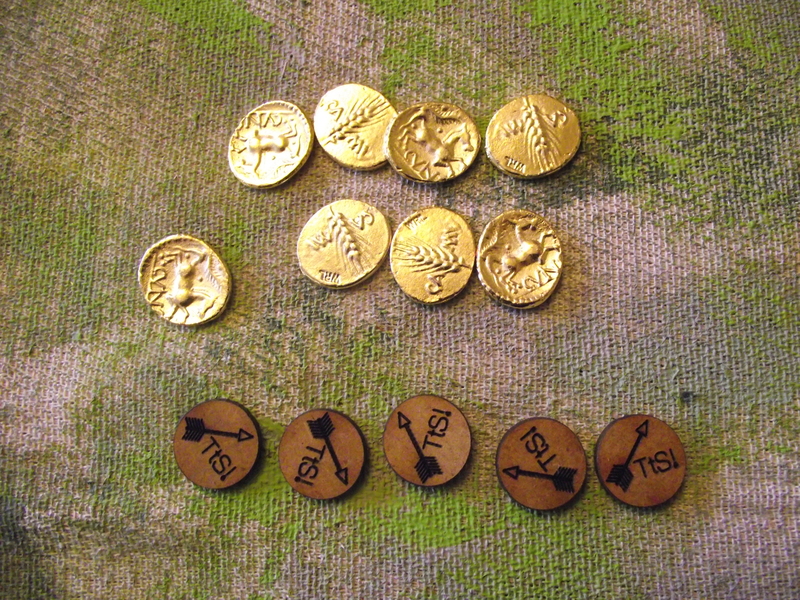 The Romans decide to keep in line and not go for any second moves – however the cavalry on the right would have liked to but with a 9 and no general present they failed with a 3 (lower than the 9 they drew first time round). 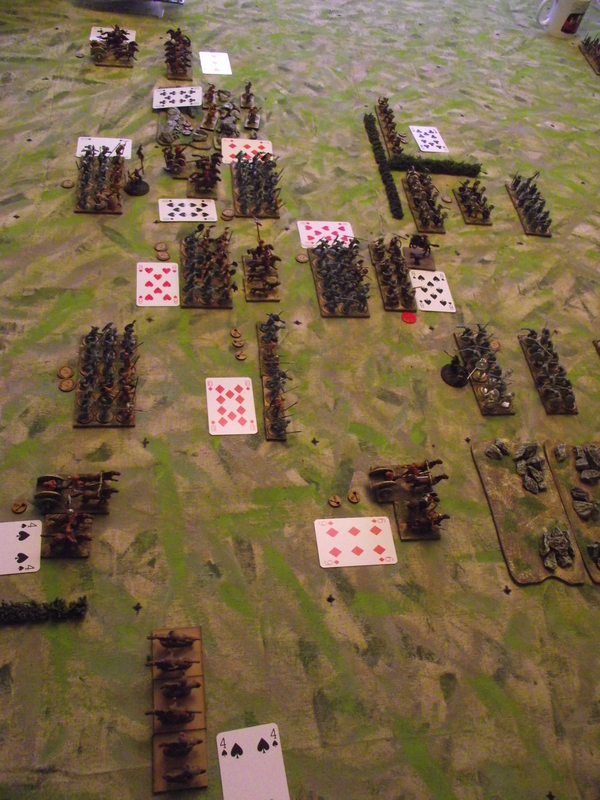 A brilliant start – the Chariots charge into the middle getting positioned to rain down javelins with a 2 (which would make a second turn easier – 70% chance) – sadly the next Chariots drew an Ace – automatic fail and the whole command stops. It seems to be a choice between seizing the opportunity or going safe and trying to get your whole command moving. 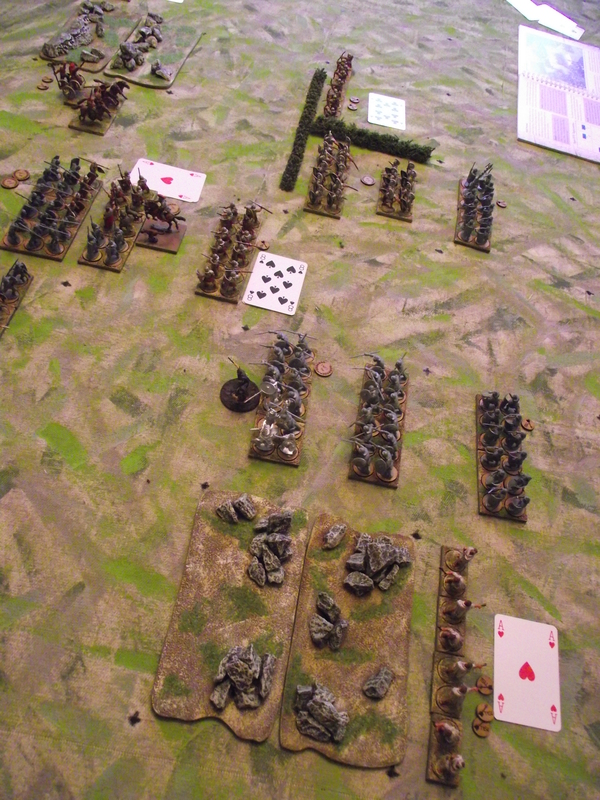 Next the British second command – success in that all the units move forward – however the Chariot gets a 10 – so unless it pulls another 10 (8.75% chance) wont be able to fire/move again this turn – a lost opportunity. The charge in the centre looks good – moved with a 4, with the General present – but with a second draw to get a move to contact – pulls a 3. No more moves. The player missed the chance to use the General to change the card!! Both sides are now pretty close to each other, except for the failed British left flank. All the cards from the game decks are now collected and the decks shuffled – I guess this is to stop card counting!! Onto the Roman second turn. 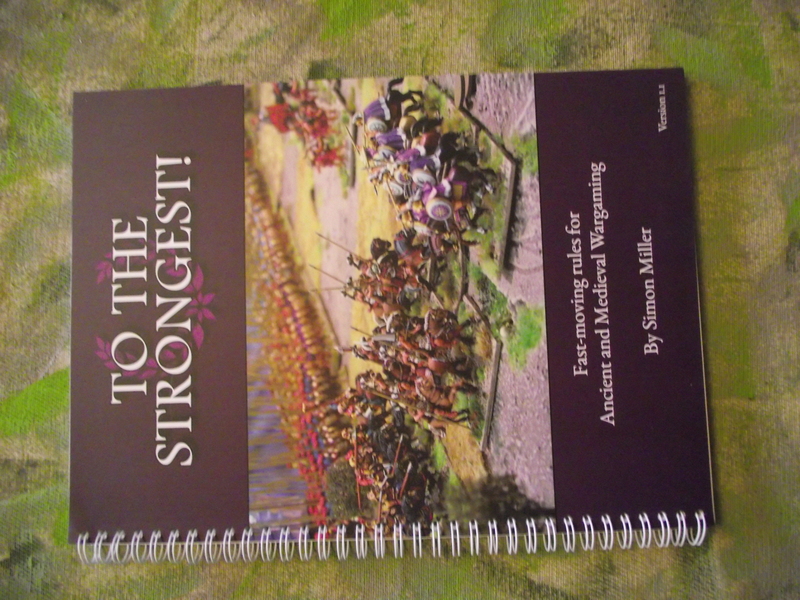 The left hand command starts again pushing the cavalry forward past the Chariots looking for a flank attack on a second move – that idea comes crashing down as the light slingers attempting to move into the rough ground to fire at the Chariots draw an Ace – this whole command fails……. The Roman right hand command is quite set – the legionaries lined up to accept the British charge – but lets face it – they are the attackers – so the player moves them into contact and combat…..
First off the Roman Cavalry advance up the flank to position themselves for a flank attack if a second turn can be got – they draw a 3 first time (52.5% of a second move). Then the Roman Light archers fire on the Chariot – they need an 8+ and draw a 10;success. The British Chariot needs to make a save – they need a 7+ and draw a 9 with a +1 modifier for being Chariots (dispersed target). The archers fail and lose one ammo chit. However this is a shooty fail and not an activation fail so the move continues. The next unit moves the Roman Legionaries in the middle – they charge with a 2 into the British warriors and a melee happens before any other unit activations take place. The Romans need 6+ to score a hit – they draw an ace;fail. However the Romans have a hero with the Legionaries – and this enables them to redraw the card – a 2 and still they fail!!! So much for Roman bravery, scratch one hero – the hero token is removed. 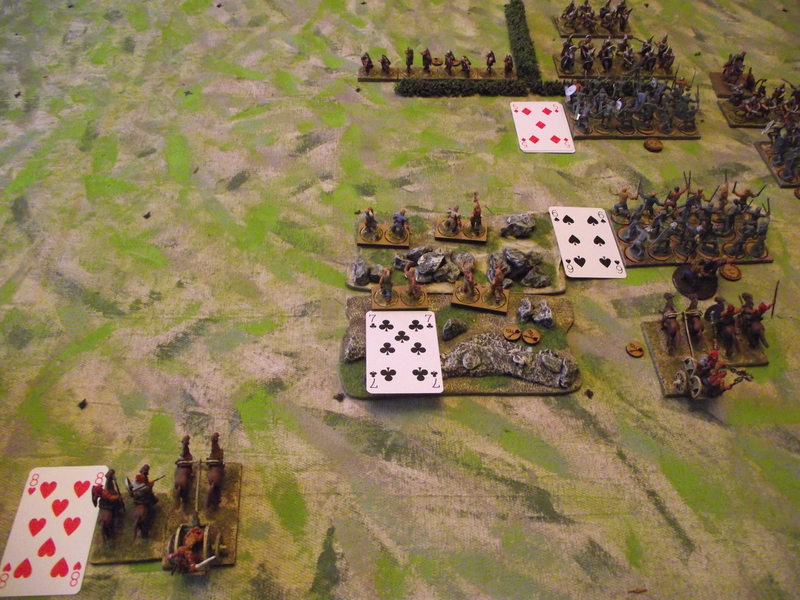 The British, as they survived the melee, can fight back – again they need a 6+ (it would have been 8+ if it had been disordered by a hit) – they draw an 8 – the Romans needs to save on a 6+ but pull an ace;fail. The gods are not with this unit. The unit can take two hits the first making it disordered which will affect combat and movement, but General can rally this disorder if he is present and draws a successful activation and the unit isn’t being menaced by an enemy. It doesn’t look good for the unit at the moment. TSS melee only go on for one round. A further activation is required to continue. As this was a fighty fail and not an activation fail the move continues. The Roman general decides to charge the second row Legionary unit through the unhappy Legionary unit and then into the British warriors, which he succeeds in doing by drawing a 5. Prior to meleeing the Romans are going to throw their Pilums – a one off shock missile attack. Drawing an ace (another one – someone check the cards!!) they fail and the ammo chit is removed and melee commences. Drawing a 5 for the melee they fail so the General (who is accompanying the unit) decides to use his once a turn power to redraw the card and gets a 9;success! The British need to save and fail with an Ace (surprise surprise) – they become disordered. Because the British warriors are classed as a deep unit they get three hits – so the first hit disorders them. As they survived the attack they fight back – needing an 8+ (+2 on the standard 6+ because they are now disordered) they fail with a 3. They do have heroes but choose not to use them yet. The Roman turn continues. 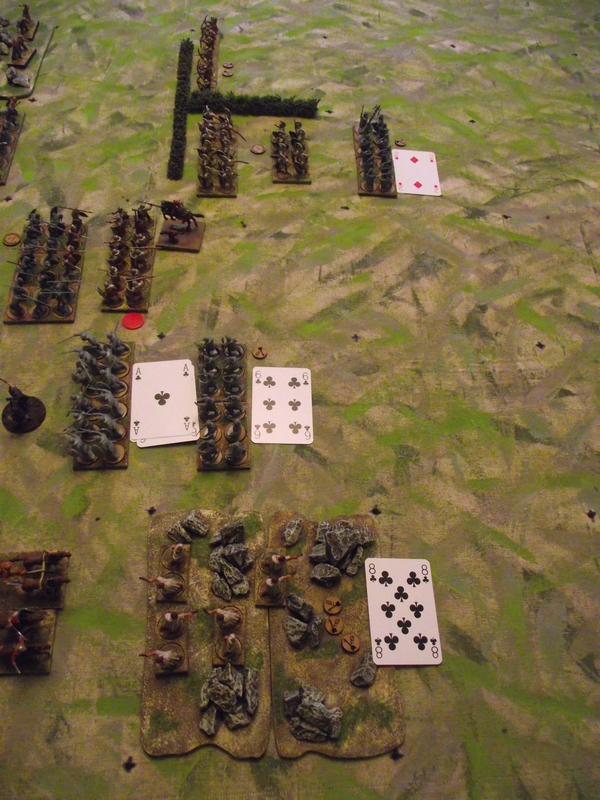 The General decides to rally the unhappy Legionary unit – this unit was on a 2 card, so rallying just requires a further successful activation (+1 for enemy in charge range), they get an 8 so the disorder marker is removed. (OOPS – its been pointed out that this is wrong – the activation just allows a rally to happen – another draw should be made to see if it was successful)The player gets cheeky and sees if he can activate again the Legionary unit that was in melee previously – it’s on a 5 presently but an ace (yes another one!!) puts paid to that idea and indeed to the Roman turn. 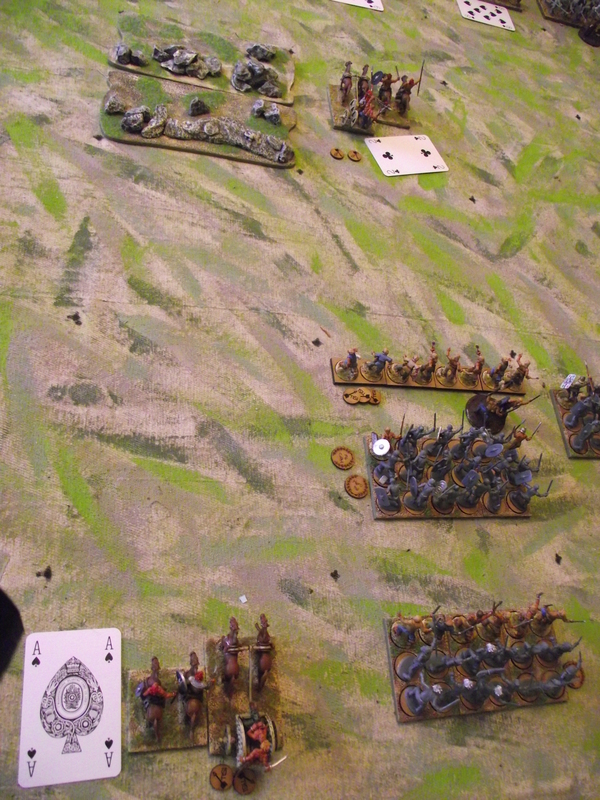 On the right the British Chariots move up and shoot at the Roman cavalry, failing to hit and losing a ammo chit. In the middle the British Chariots fire at the Roman Legionary unit that charged forward (as the melee ends each turn they are not considered to be in melee and therefore can be fired at).They succeed but the Romans save. Carrying on (again the turn hasn’t finished because it was a shooty fail not an activation fail) the British slingers move up to hold the rough terrain, they have no targets presently. The two British warrior units move up and one moves through the Chariots that were firing earlier (units can move through other units as long as they are facing the same direction and don’t break the 2 units a square rule – and in this case a 2 deep units in a square rule)). As a final move the command attempts to reactivate the flanking British Chariots to fire again, they were on 7 and they draw another 7 so fail as they need to get higher. This player now passes to the right hand player as he does not want to move anything else. 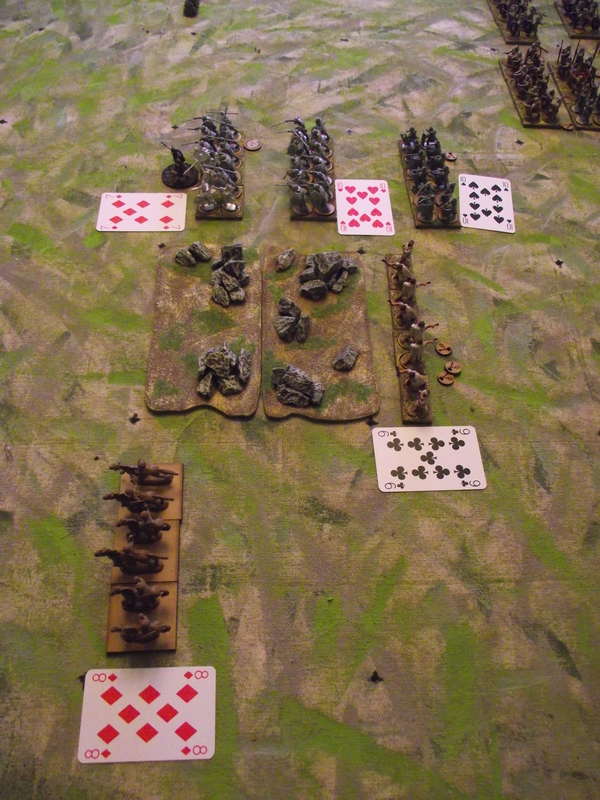 The right hand player has a choice – charge again in the centre first or try to skirmish with the Roman cavalry on the flank – it choose to skirmish first. Both units failed to shoot successfully. Next up the player pushes the middle unit into the charge again, causing a casualty but the Romans save. Pushing the unit behind through they cause a casualty on the Romans who fail to save and are thus disordered (OOPS – this may have been where two deep class units were in a square together which is not allowed). 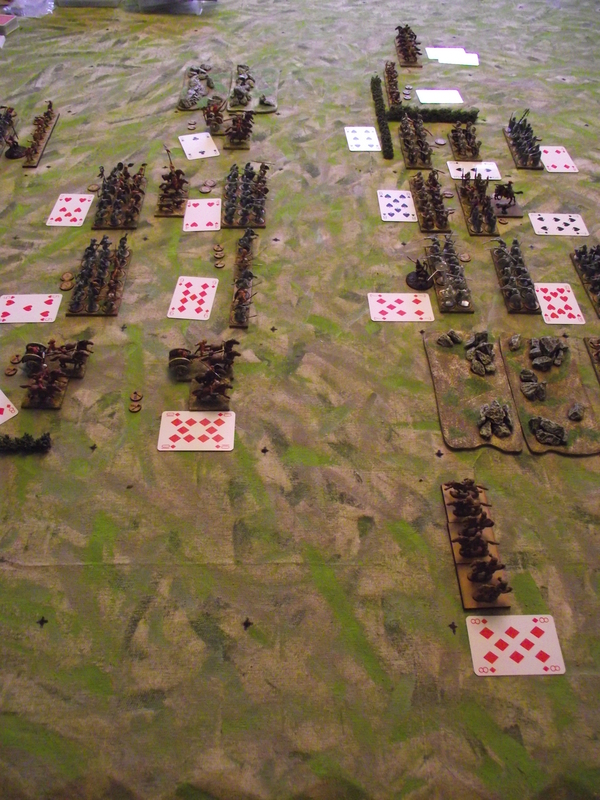 The General then decides to change the initial card and pulls another activation, the unit charges in again and causes another casualty – the Romans fail, causing a second hit. As the unit can only suffer 2 hits it is removed. Ouch, first blood to the British. Two Roman victory medals are passed to the British General. The British general sensing blood successfully attempts to activate the unit again to charge the next Legionary unit, scoring a hit, which this one also fails becoming disordered. However activation fails and the General has already used his power to change the card this turn, so the turn ends and cards are collected and shuffled. Next move the player on the Roman left hand command decides to boldly push the middle auxiliary units forward and moves the Slingers into the rough ground. The Cavalry are turned to face the Chariots. The General orders the Auxiliaries forward and but only one unit moves forward forcing the British light javelinman to evade behind a unit of warriors. However the Romans are left a little high and dry. An ace (again) ends the players turn. The player on the Roman right hand command first of all tries to firm up his centre – but fails! To move diagonally is a difficult activation and requires 3+, the general draws a 2 thus failing both this units move and his whole turn! Back to the rampaging British. The left hand player starts lucky, getting his Chariots to fire at the Roman cavalry, hitting it. The Roman unit fails its save and as a light unit it only has one hit so it is removed. One Roman Victory medal (light units =1 medal) is passed to the British. Further activations see the British warrior units move up to the auxiliaries behind the hedge and the slingers start to fire (unsuccessfully) on them. 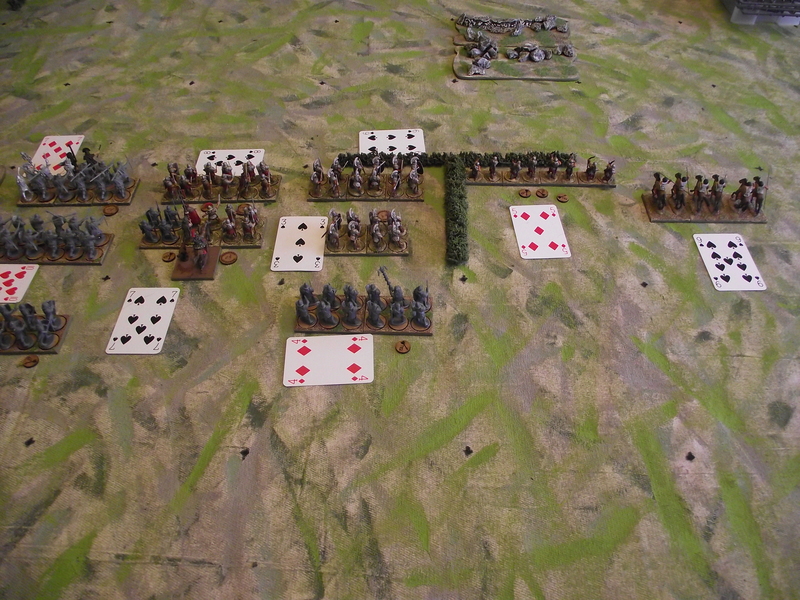 The players command fails when he attempts to charge the British warriors in. 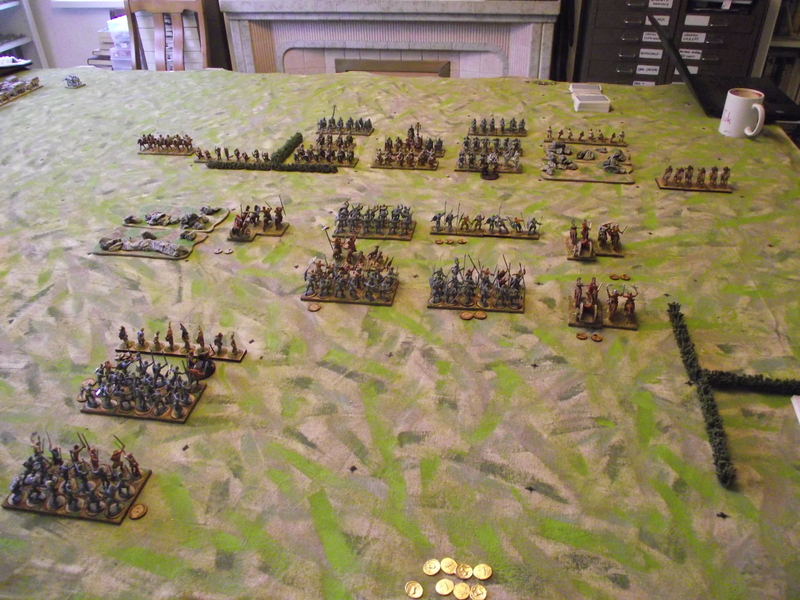 On the right hand the British player decides to press the advantage – he orders another charge which gets in causing another casualty on the Roman Legionary unit, it fails its save so is lost (it previously was disordered and the General decided not to rally it – big mistake). Two more Roman victory medals are passed to the British. The Roman General is lucky to survive himself (saves on a 2+). The British player orders the British warriors on the right to charge into the Roman auxiliaries causing a casualty, the Romans lose a hero attempting to redraw the save. 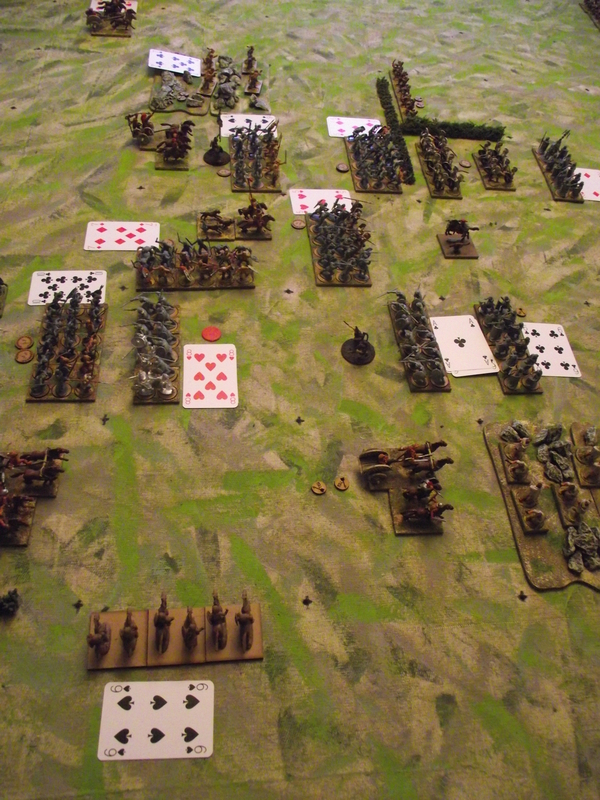 The player orders the central British warrior unit to turn to face (one activation), and then with a second activation charge the flank of the wounded auxiliary unit. As it’s a flank hit they get a bonus hit and succeed with the second – the auxiliaries fail and are removed. The last two Roman Victory medals are passed to the British, as these are the final ones the game is over and the Romans have been comprehensively thrashed!! A really enjoyable game where the basic rules and card draws required become like second thought, and using the rules very easy. So in reflection how did it go? 1 I forgot the stratagem cards entirely. 2 I think I may have forgotten that the British warriors are considered deep units and therefore cannot occupy a square with anything other than a light unit. Ooops……this may have made a difference to the British central push. 3 The game played very quickly and I was initially worried that it may all revolve around luck – the luck of the right card. Because you only need a 2+ to activate it leaves a lot of room to perhaps be able to move again – and this is where the tactical decision-making comes in. All told I will play these again and look forward to it. The rules themselves are very well laid out and easy to read and comprehend unlike some I can think of. As someone who has played DBA on and off since it came out I love the simplicity the grid squares brings to movement and unit position and would play these over DBA. Excellent write up. Thanks. TtS is our favorite set of rules. However, we roll a 10 sided dice instead of doing the playing cards [doesn’t clutter up the battlefield], and place little number chits by the units [we purchased from Simon at the Big Red Bat Cave].